Here is another relic from Southeast Asia in the days before the widespread use of the electric microphone. Voice and music emerge from a deep layer of surface noise. Such is the case with these early recordings: however tweaked and lessened by me, surface noise is inevitably an integral part of the listening experience. In particularly hot and humid areas – perhaps Siam for instance, where this recording was made ca. 1927 – recording engineers would often have to pack their wax masters in dry ice to protect them from melting. Working without electricity…sometimes recording entire orchestras who played into a large horn…carting boxes of heavy equipment and hundreds of wax masters from place to place, perhaps country to country, for sometimes months at a time…the odds seemed against these expeditions. Yet many hundreds of thousands of records, perhaps even several million, were recorded all over the world before the microphone started appearing in recording studios in the mid-1920s. Recording minutiae: originally, this selection was recorded by the Beka record label, and then released by Parlophon. Beka and Parlophon were German companies, owned by the larger entity Carl Lindstrom A.G., which was purchased by the British company Columbia in 1926. The smaller German companies under the Lindstrom banner operated independently of their British owners for several years, until Columbia/Lindstrom eventually fell under the banner of EMI, and Parlophon became known as Parlophone. 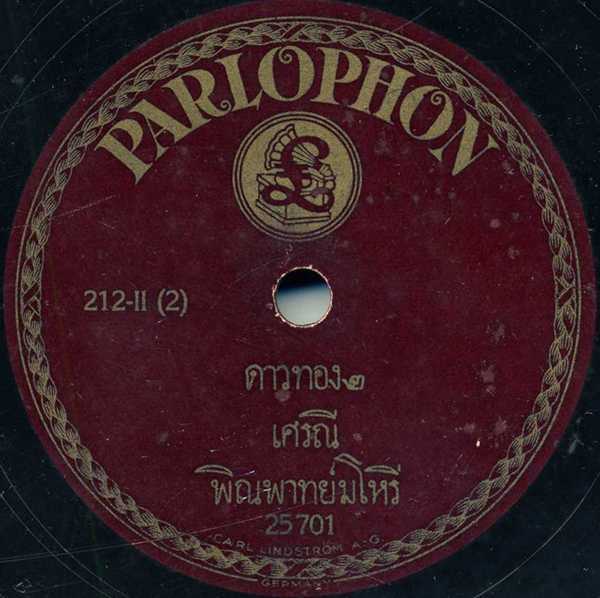 Many thanks to Philip Yampolsky for discographical insight, and to Pluethipol Prachumphol of the Antique Phonograph and Gramophone Thai Society for help with the translation. Thanks also to Lawrence Ross for additional information on Thai music and helpful translation. Brilliant work Jonathan! If this is truly an acoustic recording you’ve really done an excellent transfer! Me again – the name of this kind of music is usually transliterated as pī phāt, but I don’t know how to pronounce it…. Thanks, Tony, that’s very nice of you. Yes, it indeed is a late acoustic. Those Parlophons would have an English pound sign stamped into the dead wax if they were recorded electrically – alas, this one does not! I was confused about this as well, but in checking with both my Thai translators on this track, both insisted that what was written was in fact NOT “pi phat” but “pin park.” I was sure it must be “pi phat” myself, but both were insistent. So, essentially, “pin part” seems to be a synonym for the “ranat” instrument. So I suppose it could very well be a form of “pi phat” ensemble, but the label itself simply calls it a “pin part” ensemble, which is synonymous for a group of ranat players! Thanks for the clarification Jonathan – a little knowledge dangerous as usual! An update to this post was made on 2/5/09, with some corrections to the text, thanks to Lawrence Ross. Second, clarification was made in the paragraph on musical instruments, with regard to new information from Mr. Ross on Pluethipol’s comments above. Phin-phaat is NOT a synonym of “ranaad” or “ranat” as I indicate above. It is a group of instruments where the ranat is a main instrument. Also, “pii” is a reed instrument, not a flute, as mentioned in Pluethipol’s comments.